It is estimated that globally 500 plastic billion bags are used annually which is approximately 133 bags per person. Plastic bags don’t biodegrade, they photodegrade. This means they break down into smaller and smaller toxic pieces, contaminating soil and waterways which then enter the food chain meaning both humans and animals are now ingesting these pieces. The new globe baggee has been designed to help people re-use and reduce the number of plastic supermarket bags they use. It is a brilliant British designed key chain device for storing all types of plastic bags. Bags are simply stuffed inside and you can pull out one at a time when needed. Great for shopping, dog walking or camping. The device can be clipped to belts, handbags or key rings ensuring that you don’t forget to take bags when you go shopping. I’ve been trialling the bagee here at GreenFinder H.Q for the past couple of weeks and have attached it to my handbag meaning that I’m never without a bag when I leave the house. It’s been handy for the school run when there have been unexpected wellies or pumps or wet umbrellas to bring home and also on days out when the kids have picked up random items (like they do!) when we’re out and about. I’ve fitted in two average sized bags in my baggee and it’s been perfect for the mid week shop or picking up the odd loaf of bread and pint of milk. It’s been really handy not having to rifle around for bags and have them close to hand especially as I’m usually trying to juggle children, cycling helmets and shopping at the counter. 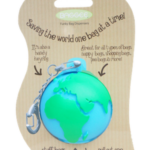 The baggee can also be used for dog waste bags and clipped to a belt or coat and can also be used for nappy bags and other outdoor activities. The globe baggee retails at £4.95 and can be ordered online here. The baggee collection also includes the quirky Mr Men & Little Miss range (Mr. Happy, Little Miss Naughty, Mr. Bump and Mr. Happy) along with the Doggee, a baggee for dog walkers.